Ms. Marvel is getting a new uniform on Season 2 Chapter 4. The exact circumstances that lead to Ms. Marvel changing her name play out in Mission 6 of this awesome new Chapter. Make sure you do her deploy to get the full story! Tomorrow we'll tell you a little more about Chapter 4's villains. Not sure how to feel about being shafted out of a Blaster if I equip this outfit. Also someone needs to review their work before posting, last time I checked this was Ms Marvel and not Captain Marvel. @Brian Collins She now operates under the name Captain Marvel. They could have done better. Different abilities or something that makes her stand out more. Or maybe use a character that doesn't have another uniform. But then again, the creators never think outside the box. @James Best jr. I can see her being quite useful in PVP, there is lot's of paragon exploiters and exploit attritions going around. She will make the cube's level 4 ability far less deadly. @Brian Collins Well you really need to check again because you are over a year behind. 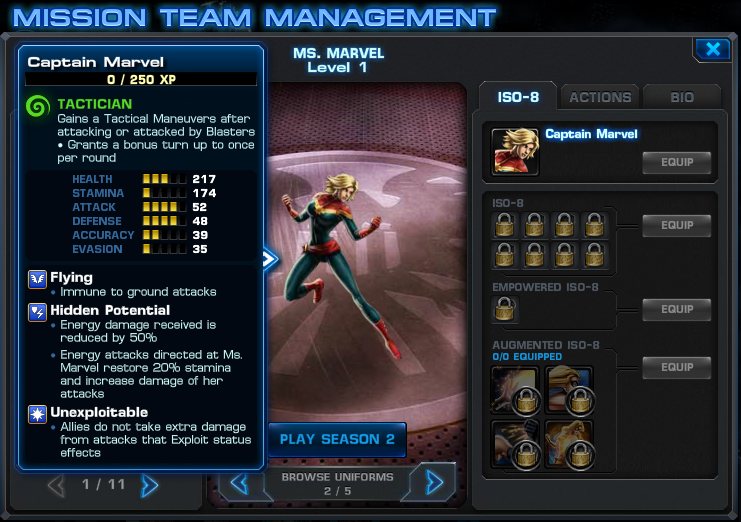 I wish Playdom to release Mystique (in her classical uncanny costume or in Romijn's look at X1 and X2) as a playable character... like Dr Doom and others, just like a consultant for SHIELD regarding so particular affairs to be coming... but she's one of my favourite girls and I want to play with her, not against her... of course, she having a shapeshifting combat ability.